This is our top-of-the-line honcha, or traditional green tea. Top Leaf™ Green Tea is specially pampered in its own separate corner of the tea orchard. Not only does this tea receive extra fertilizer (organic, of course) during the growing season, but at harvest time, the growers pick only the top layer of young tea leaves. The result is a distinctive, more subtle, gentler flavor. This tea is always first flush. 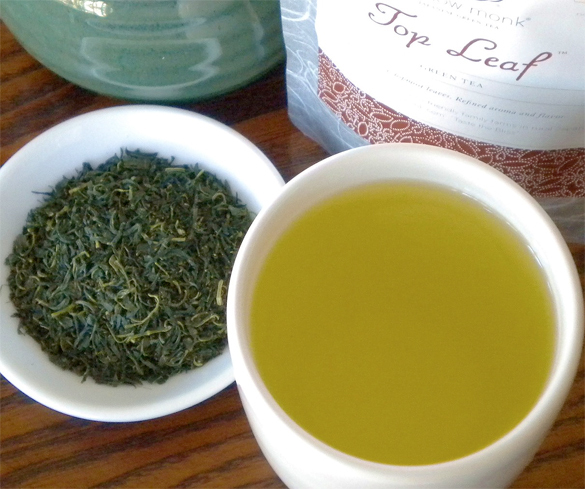 Top Leaf™ is a winner in the 2010 North American Tea Competition. This is one of the best green teas I’ve ever tasted. The flavor is stunning! The dry leaf looks a lot like a Gyokuro – it is deep green in color and has a very fine cut. As it steeps the leaves expand quite a bit – it is best to brew this in a tea pot which will allow for plenty of room to achieve the fullest flavor. And believe me – you want as much flavor as you can get from this tea – it’s really remarkable! There are notes in this tea that remind me of a Gyokuro, and notes that remind me of a Sencha, and still other notes that remind me of neither of these types of teas. It is a very complex tea. I can taste the note of grapefruit as described by Mellow Monk, it is a subtle note, although still quite distinct. It has a vegetative taste, but not a grassy one, if that makes sense. That is to say that it doesn’t taste like grass; it tastes like freshly steamed and lightly buttered vegetables. The taste falls somewhere in between broccoli and asparagus, but a bit more mild. It has no bitter aftertaste to it. There is a very mild astringency that doesn’t start to feel dry until well into the aftertaste. The tang of citrus sits upon the tongue in the finish. This is the first tea that I’ve had the opportunity to try from Mellow Monk, and it has certainly piqued my interest to try others from them. If you like high quality Japanese green teas, you really MUST try this one. It quickly became a favorite of mine – after just a few sips, I was hooked!